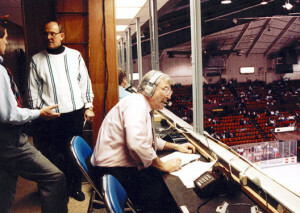 Bob Chase’s voice was known to generations across the continent during an incredible 63-year tenure with WOWO Radio and the Fort Wayne Komets. From 1954 to 2016 he called an estimated 5,000 hockey games, 10 years of Big Ten football, 17 years of high school basketball, and covered the Indianapolis 500 for 27 years. He was honored by the National Hockey League in 2013 with the Lester Patrick Award for his contributions to the sport of hockey, and was inducted into the Indiana Sportswriters and Sports Broadcasters Hall of Fame. Bob Chase first worked briefly at a small station in Michigan before getting hired by WOWO in 1953. In addition to sports, for many years he hosted an afternoon music program “The Bob Chase Show,.” and held station promotion positions. Chase died of congestive heart failure November 24. 2016.